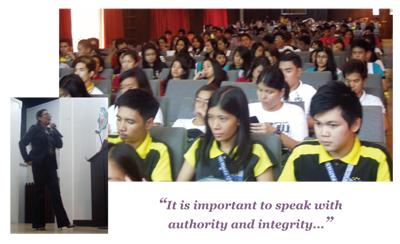 Ms. Devie Malabanan, conducted a seminar for Accounting students last August 11, 2013 at La Salle Dasmarinas, Alumnae Auditorium. She introduced AHRO Support Services to JPIA Members, focused on the importance of giving excellent performance in whatever they plan to engage on, especially after graduation and will be landing a job. With the mission and vision to produce cutting edge professional service and students will be launched to their highest potential. On the Job Training will be offered to students together with AHRO’s affiliate firms, to equip them with the solid foundation to become someday in the business world. To the fact that they all wanted to be a Certified Public Accountant someday, Ms. Malabanan provided an alternative course such as CFA, CMA, CIA, CICA and MBA. I was happy and thought that this could be revenue stream for me. I have learned that there is nothing I can’t do, as well it is difficult to speak up there in the stage with such a crowd of around 250 people. It is important to speak with authority and integrity. I resolved to study more to enhance my skills so I can best serve my clients. I also thought that this type of activity could be offered to different schools not only as a promotional strategy but for a fee. Also, the rain did not matter to me because I was holding with me, framed certificate of appreciation, my first ever certificate as a speaker! I felt good to hear nice comments such as, “Oi pa picture tayo para mahawa” though I’m not sure what does it mean. I’m happy to see them sincere in asking me question like, “Maam may pressure po ba talaga pero na strike po talaga ako sa sinabi nyo”. Fulfilling words from Ms. Malabanan.